Not all that long ago, Twelve South added Journal to its line of iPhone cases, which has a modern flair compared to the vintage appeal of the BookBook. More recently, the line has expanded again, with the protective cases for Macs and the multi-purpose accessory case CaddySack get the same styling. Journal's trademark are clean edges with subtle touches and accents, reminiscent of a leather-bound journal. On either model, Twelve South's logo is embossed on the back, Journal is down the spine, and the iconic feather quill is in the lower right corner of the front. Their exteriors and designs are quite similar, but the interiors and purposes are vastly different. Compared to the original BookBook CaddySack, the interior on the new model is laid out the same, but with a few small improvements. To start, the Velcro-adhered adjustable straps on the right now are black with leather patches. The elastic-infused straps also are a bit thinner which is a welcomed change that makes it easier to get gear in and out of place. 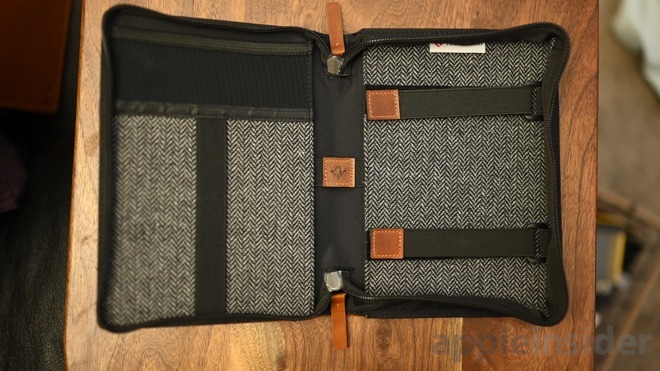 The left side is similar, using the same thinner straps that is divded into three sections for holding smaller dongles and adapters. Above the straps is a small pouch that is perfect for SD cards or equally small pieces of gear that get lost in a bigger bag. Journal CaddySack is a handsome tote that easily holds everything we need. When we had the original CaddySack, we loved it but the design wasn't for everyone and it didn't hold all the cables we needed. With the iPad now adopting USB-C, it makes it easier to pack our bag and ditch certain adapters that we used to carry around. Where to buy: You can grab the Journal CaddySack for $89 on Amazon or from TwelveSouth directly. We've taken a look at a few MacBook sleeves and cases lately, including a devicive denim option and a high-quality leather one. Twelve South keeps things quite thin, while still adding some features not found in other cases. 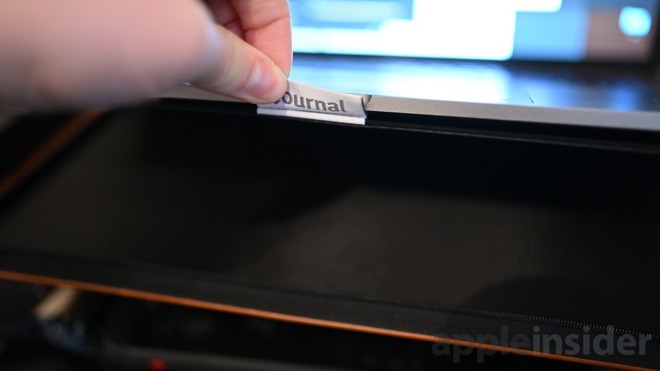 Journal stays on your Mac whenever open or closed so it doesn't have to be removed. It also keeps bottom protection against any questionable surfaces you rest your Mac on. Beneath the Mac is a small pull tab to access a hidden compartment to tuck away a few papers. We don't bring a lot of papers around, but having this is without a doubt a convenience when we do. Our biggest downside -- aside from the price on the 15-inch model, is the elastic straps around the corners of our Mac. They do just slightly encroach upon the screen, but they can always be unstrapped. 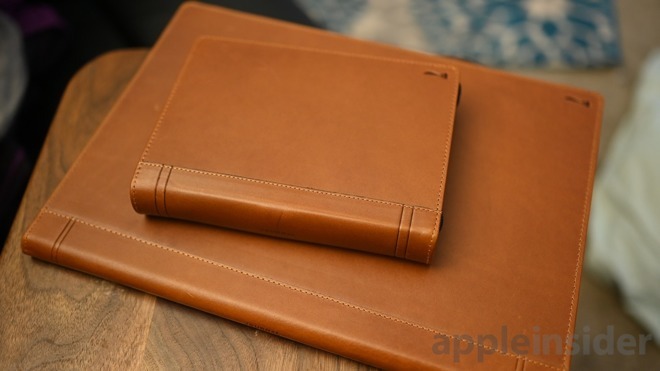 Where to buy: You can grab the Journal in 13-inch and 15-inch MacBook Pro sizes for $149 and $169 on Amazon, or from TwelveSouth directly. "including a devicive denim option..."
Devicive? Did you mean divisive? Lordy.